We are located right in the middle of the Curtin Shops. I am Dr Jana and together with Dr Erin and our nurses, we would love to become your pet’s personal vet. We provide a high level of veterinary service comprising an advanced level of medical and surgical care. 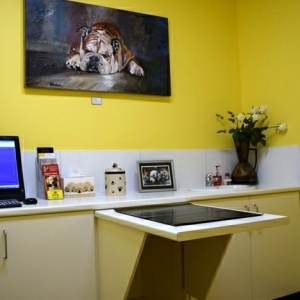 Our clinic has been especially designed to maximise comfort for your pets and to minimise any stress. Cats and dogs enjoy their own segregated consult rooms and surgical wards. Feline and canine pheromone diffusers in those areas ensure a relaxed atmosphere. We’re here to listen to your needs and that of your furry family. Please look through our website and get to know us, our own pets and the services we provide.